If you read my reviews regularly, you know I'm obsessed with this authors Psy/Changeling series. It makes sense to try out her other books so that's my summer reading project. I started with this little novella. Since I know this authors writing and I've read quite a few of her little novellas, I think I can safely say that this one is just a little different than the rest of the series it belongs to. This one is set with the angels and not with the hunters. It's got a historical feel to it as these creatures are hundreds of years old and don't really live as the humans do at all. Living on sides of cliffs and using fire to cook are just a couple of things that gave it that feel for me. Add the flying to the mix and it felt very different. I love both Galen and Jessamy. Galen's nickname is the barbarian. He is the son of two warriors and was raised to be one as well. The social graces are not his way. He's direct and forward in his comments and methods. When he meets Jessamy, he asks after her and then he courts her. Nothing holds him back, not her shyness or unease with the disability that she has. With one crippled wing, Jessamy cannot fly. She teaches the young ones and is stuck at the refuge since it takes flight to leave that place. No one courts her. She has lived this way for hundreds of years. So shocked would be an understatement of her surprise when Galen begins to do so. They are adorable together. 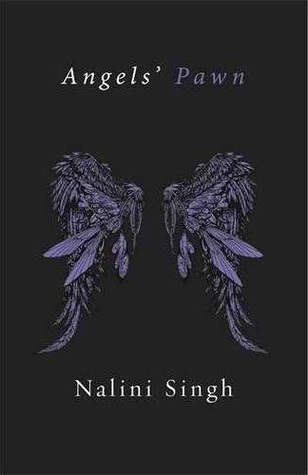 I will admit that this is not yet a favorite but I will read the next one to see if the actual world of angels, vampires and hunters draws me in as well as the Psy/Changeling world did. 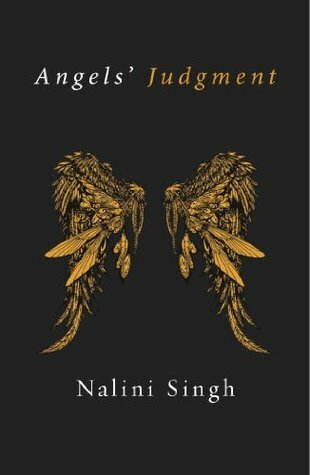 Angels' Judgementis the compelling story of passion, love and danger in the Guild Hunter world. 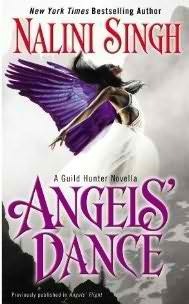 Sara and Deacon are Guild Hunters, their life's work is catching and capturing - or killing - rogue angels. It's dangerous work and sometimes life or death decisions must be made in a moment. And when a judgement has to be made, should love be allowed to get in the way . . . ? Interesting. The first little novella was set in the Angels' part of this world but this one in the hunters. I will say that I'm really enjoying the hunter end of things. Sara is on the verge of becoming the director of the hunters but before she accepts she's on a job with the loner Deacon, slayer of the Guild. He keeps to himself and doesn't make friends with those he may one day have to kill for going bad. But the heat between them has them both considering possibilities. It's nice to see a women being considered for such an important job in this paranormal world. She's definitely badass enough. As she and Deacon hunt down the mystery of who's killing vampires, she shows off some awesome skills. Deacon notices too. That boy is one hot hunter. But by far the best part was when he turned to her to protect him in the gay bar. Hehe. I definitely enjoyed this one more than Angel's Dance. It was a better taste of this world and I think I'm going to enjoy this series. An interesting twist on angel's and vampires with great characters and hot chemistry, what's not to love? 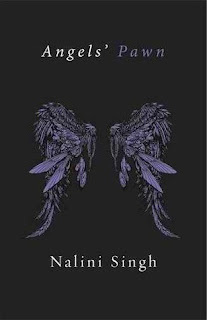 Angels' Pawn is a tale of flirtation and danger set in the Guild Hunter world. Ashwini and Janvier have no reason to be drawn to each other - but they are. Even when they're on opposite sides of a debate there's a spark between them which doesn't want to die. Will it be fanned to become a flame...or are they both the pawns of angels? I'm still trying to figure out if this is the end of this story. It felt so much like the first third of a great book and I'm searching through the series looking for where it may continue! Because there MUST be a continuation! So I am enjoying this world though is it more brutal than I generally enjoy. I'm still trying to get the feel of the dynamics between angels, vampires, hunters and humans. But I like it. Though this installment only frustrated me, I will be reading on. I wanted more. I wanted an ending. But this vampire is still doing his thing which sometimes involves Ashwini hunting him and this hunter is still doing her thing which is taking jobs from the guild. I was expecting something to change at the end. Yes, yes, there is a little story they deal with together and that's the point of the novella BUT I wanted more. To be fair, I will admit here that novella rarely satisfy me.